Life Is Sweet...: Has it been that long? Well hello again... didn't realize that the last time I posted was on August 25th. I've been doing make-it take-its every Saturday and spending most of my free time cutting and die cutting out the supplies that are needed. I'll be at the Navy Exchange this Saturday with Jean from Dandelion Designs from 2-3 pm. I'm pretty sure that anyone can come to this food festival since it will be in the parking lot under the big blue tent. Here's one of the cards we made last week Saturday at J's. I really enjoyed seeing everyone again. We stamped the background on kraft paper using one of the new wood block print Christmas stamps in white Memories ink. 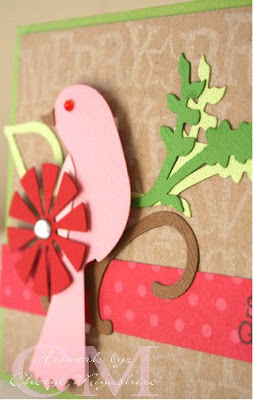 The bird and flowers is a Sizzix bigz die. I die cutted all the pieces for the kits except the bird and flower. 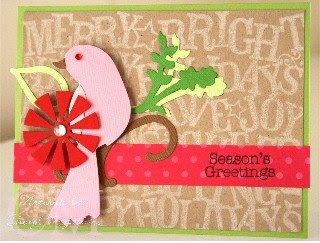 The pink polka dot paper is from the DCWV Butterflies and Blossoms paper pack. This was our 2nd card that we made. 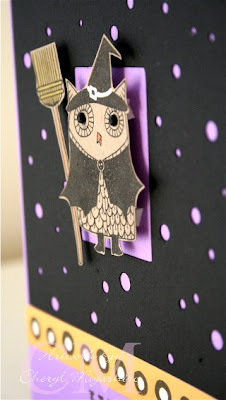 We stamped the owl and broom on kraft paper, and see that black paper with the pukas. That was cut out using my Cricut machine. The cartridge that I used was Stretch Your Imagination. Well, it took me over 3 hours to cut enough for everyone. I have the old 12" machine and could cut only 2 cards at a time. Here's a closer look at the card. I stuck dimensionals under the owl. 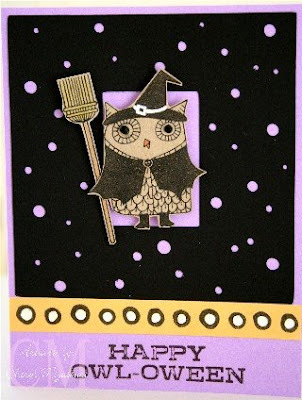 All stamps are clear stamps and cardstock from Hero Arts. I have a bunch of cards to share and will post more tomorrow. Have a great night everyone and thanks for stopping by.